Recently, I was trying to check my computer specs and ran into a snag. It had to do with this Meltdown and Spectre chipset nonsense. It seemed that some articles referenced the “chipset” and others the “code” name. I didn’t have a decoder ring so decided to see if various system utilities could help me answer these questions. I came away thinking that these profiler tools vary widely in information and details. For this article, I’m focusing on free tools that help me determine what hardware and software I have without prying the cover off. This can be very useful when troubleshooting or talking to tech support reps because they often need basic computer information. But the degree of information you need really does depend on the circumstances, which is why I’ve included multiple solutions. 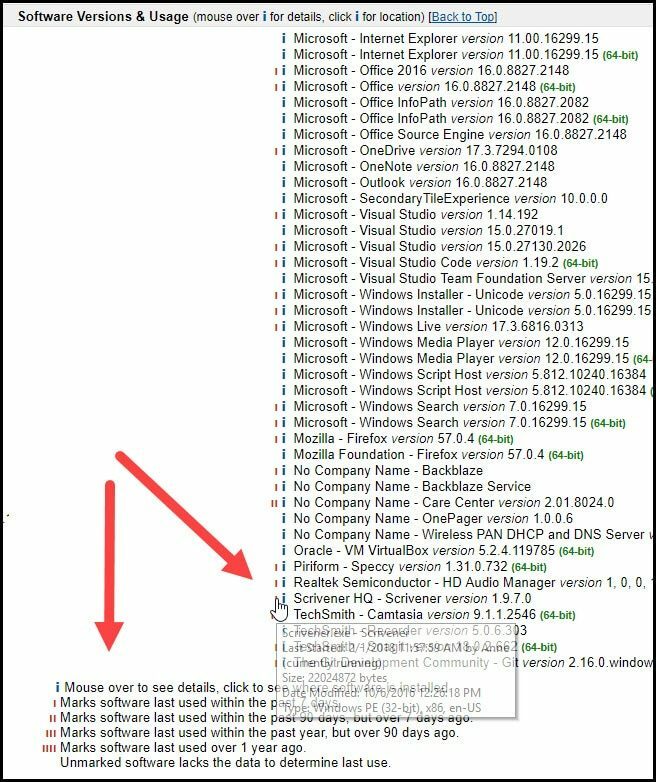 Microsoft actually provides a number of tools to find out about your PC. One immediate benefit is you don’t have to download any software. These tools vary from the basics to ones that require a propeller hat. For many people, your PC’s About panel is sufficient. Which Windows Edition am I using? What’s my PC make and model? 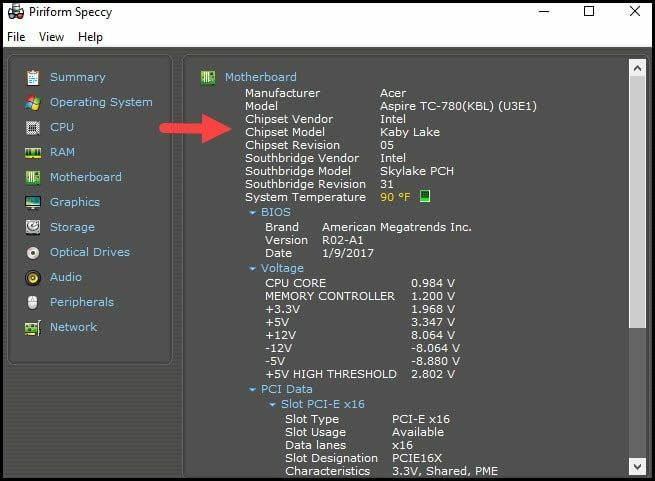 Which processor is my PC using? How much memory does my PC have? 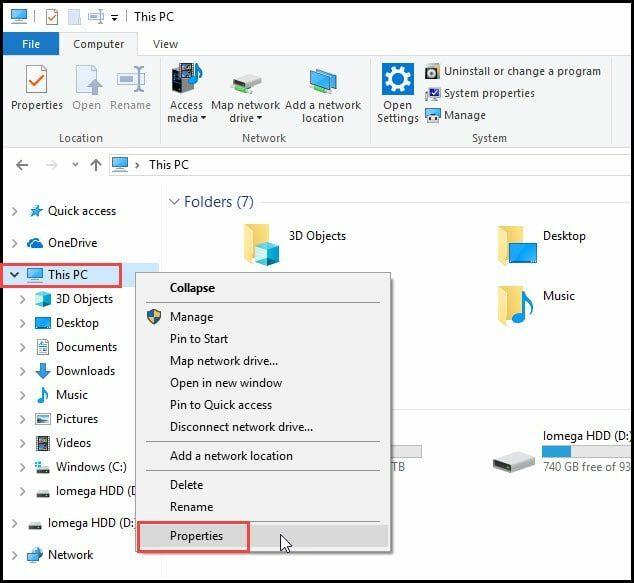 What’s my Windows Product ID? While the above panel is nice, it may not provide you with what you or a tech rep needs. The next layer can be found using a program called msinfo32.exe. This tool provides much more system information. Again, it doesn’t provide everything. For example, you can’t drill down to see details like driver version numbers. For that, you’d need to use another tool or Windows Device Manager. Still, let’s start with the built-in tools and add where needed. Press your key + R key. This opens a Run dialog box. In the Open text box, type msinfo32. If you don’t have a Windows key, you can press Ctrl + Esc instead. A resizeable System Information dialog will open that has 3 sections. Your panel may differ based on which version of Microsoft Windows you’re using and what’s installed. [a] This navigation section categorizes your system information in a collapsible format. At the top of the hierarchy, you have your System Summary. Underneath, you have main sections for Hardware, Components and Software Environment and their sub-categories. [b] This section displays the information for the category you’ve chosen. [c] A search box that allows you to find an item. This is a great feature and often overlooked. If you don’t see this feature, you may have it set to “Hide”. You can change the setting from the Edit menu at the top of the dialog. Which version of Microsoft Windows am I using? What’s the build number of my Windows version? What’s the make and model of my PC? Which processor or CPU am I using? 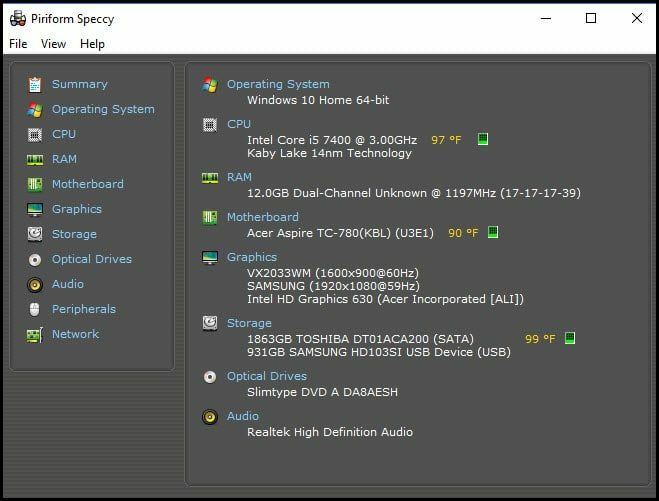 Which BIOS is my PC using? As you can see there is overlap with the Systems Properties panel. You might also notice that the labels don’t always agree even though these are both Microsoft tools. And if you’re futuristic, you may be wondering if Windows Cortana or voice search can answer these tech spec questions. Sort of. I couldn’t get her to tell me answers. However, she did give some decent results from Bing search which opened in Microsoft Edge. MSINFO32 also provides more details. For example, even though both tools indicate I’m using Windows Home 10, MSINFO32 provides Version and Build numbers. Sadly, the Help menu option doesn’t give you details about this app. Instead, it gives you the Help page for your Windows version. In addition to summary info, this tool can show you more diagnostic info such as devices that might be causing problems. In the screen snap below, you can see I have a Component that is not loading. You’ll have to drill down to Problem Devices to see it. 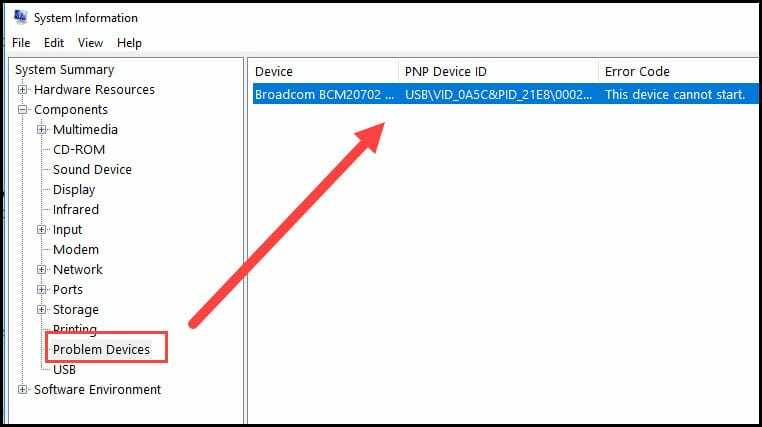 This Error Code and Device name make searching for a solution much easier. MSINFO32 gives you access to Windows Error Reporting. These logs can provide clues when it comes to troubleshooting. You can sort the entries by clicking a column heading as well as exporting the details to a separate file. I’ve often clipped text from these files for searches. And yes, you can export the information. One misconception about the tool is some people think it provides a listing of all installed software. Sorry, it doesn’t. BelArc Advisor is a free software program that compliments Windows System Information. Unlike the native Windows program, you will need to download and install the software. The software is free for personal use. The program provides a lot of information about your PC in a browser tab. The page offers little styling, but you can jump around to sections using hyperlinks. There are some key differences with this system profiler and the others. Most notably, you get a listing of installed software and version numbers that appear in your web browser. The listing shows the software name and version number. If you mouse over the small blue icon, you can see more details such as program size and if the application is currently running. BelArc was also the only tool in this summary that provided me with my PC Manufacturer’s System Serial Number. Sometimes your computer manufacturer makes it easy to find that info, often not. Another difference is BelArc identifies missing security updates. In my case, it found some Adobe Flash updates. 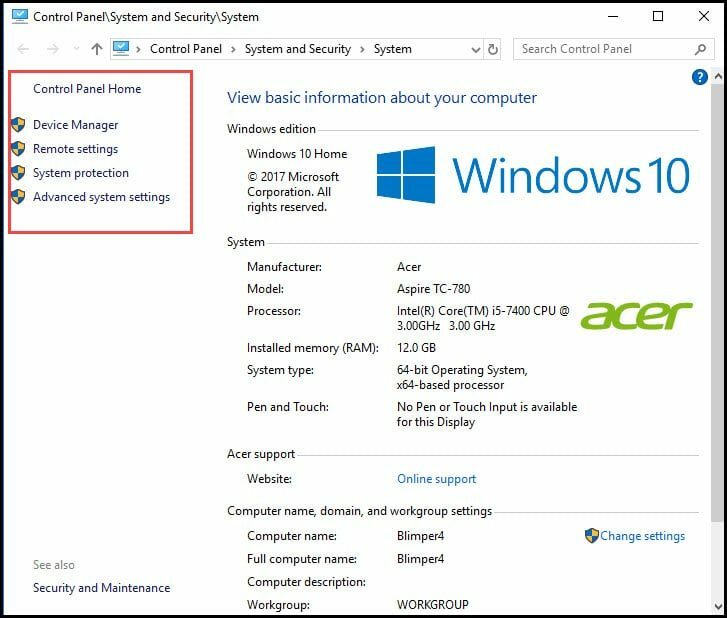 This is very useful as sometimes your Windows settings may not pick up items based on your settings. If you want to see other Microsoft updates, go to Windows Updates and Advanced options. Check the box that reads, Give me updates for other Microsoft products when I update Windows. You’ll also note in the screen snap below that each item has a hyperlink that will take you to the relevant page. One item to bear in mind is it’s not going to pick up every update or every software package. It focuses on key security items. Is my Virus Protection up to date? Are my Security Updates current? What’s my PC system serial number? What User Accounts are assigned? What devices and IPs are attached to my network? What software do I have installed and version? One drawback to BelArc Advisor is there is no menu item to export or save your info. You would either have to print the page or save as a PDF file. If you plan on moving software to a new PC, I’d suggest saving the file to some cloud storage like Google Drive, Dropbox, etc. It’s a nice inventory reference. Speccy is another free third-party tool from the same people that make CCleaner. Again, there is overlap between the other tools. What I appreciated about this system profiler is the presentation. Like the other tools, it has a left navigation panel that you can click to filter the view. If you click into an area, such as CPU, you can drill down and see more info. Of all the tools, this is the one that answered my question about my chipset. From this listing, I can see my chipset model name is “Kaby Lake”. In some cases, you’ll also see some real-time info. These are usually shown as green bar charts and tend to show temperatures. The options section allows you to change between metric and Fahrenheit. Like MSINFO32, Speccy does allow you to save your files or snapshots. This is a handy feature if you’re testing configurations or need to provide a tech rep with your computer specifications. 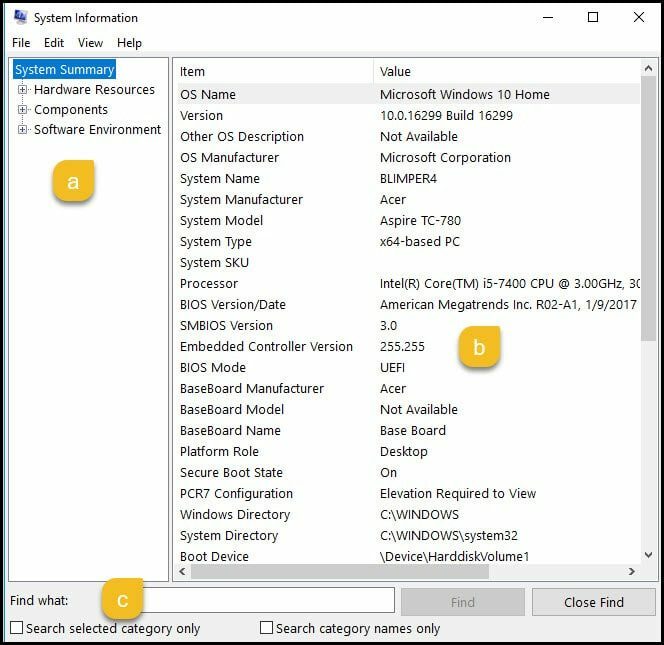 Most likely, you won’t need all these resources to check your computer specifications. However, it’s nice to know what information is easily available.